Used with either the Roland M-5000 or the V-1200HD the XI-DANTE adds upto 64 inputs & outputs at 48kHz. Features a Primary and Secondary port as well as a control option, giving users the flexibility of daisy-chaining or redundancy. 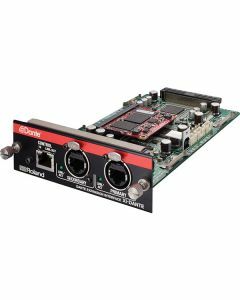 Dante Controller is a program from Audinate for managing a Dante network and performing tasks such as making audio-routing settings. It is available for Windows and Macintosh. You can download Dante Controller (at no charge) from the following Audinate website. Dante Virtual Soundcard is a program from Audinate for operating a computer on a Dante network as a Dante device. It is available for Windows and Macintosh. Using Dante Virtual Soundcard makes it possible to use programs compatible with standard Macintosh Core Audio or ASIO audio interfaces to transmit audio data direct between computers and Dante devices on the network. You can download Dante Virtual Soundcard (purchase required) from the following Audinate website. * The number of available channels will be changed by Sampling Frequency or the attached device. * Protruding parts not included.